Serbian PM Aleksandar Vucic. Wikimedia. Public domain.Successive Serbian governments have been working towards their country’s EU membership since October 2005, when the negotiations with Brussels for the Stabilization and Association Agreement started. Four years later, on December 22, 2009, Serbia applied for membership to the European Union. Though uneven and plagued with seemingly insurmountable obstacles, the negotiation process had inched forward and gathered pace over the past few years. Following lengthy and intense dialogue between the administrations in Belgrade and Brussels on the monitoring and implementation of the EU reform agenda, the accession process was formally initiated. After signing the Interim Agreement on trade and trade related matters as part of the Stabilization and Association Process in 2008, a way had been paved for a June 2013 vote by the European Council (EC) to open accession negotiations with Serbia. Six months later, in December that same year, the EC adopted the negotiation framework. The convening of the first Intergovernmental Conference on January 21, 2014 had marked the formal start of Serbia’s EU membership negotiations. While the opening of negotiations provides for an optimistic view of Serbia’s future in the EU – something that Aleksandar Vučić’s government is all too happy to take credit for – there remain a myriad of serious structural, economic and political problems that need to be addressed by the administrations in Brussels and Belgrade. It should, however, be emphasized that some of those problems are not exclusive to Serbia but are an integral part of a shared legacy of authoritarianism, nationalism, and war that devastated the region in 1990s. Even though Serbia, like its Western Balkan neighbours, has been engaging with the Europeanization model designed in Brussels for the last twenty years, it still remains a playground for a hybrid regime of a proto-democratic type. A multiparty parliamentary system with elections that often barely meet the threshold of regularity and fairness exists alongside informal networks of power, systemic corruption, a deeply polarized political environment, and a profitable union between political and business elites. There is also the question of its citizens firmly declaring their loyalty to a specific and clearly defined political community, which was noted by analysts as the essential background condition for a successful transition to democracy. Expanding on this point, political scientist Dejan Guzina, from Wilfrid Laurier University, suggested that such a condition has neither been met in Serbia nor its neighboring states of Bosnia and Herzegovina, Macedonia, and Kosovo. They all face challenges when it comes to territorial claims as well as the loyalty of their citizens and their sense of belonging. It seems that in order to integrate these contested states, the EU administration is prepared to modify the traditional application of its transformative power and engage in old-fashion nation-state building in the Balkans. In the case of Serbia, one could detect a combined EU strategy of applying direct political pressure on the government in Belgrade to follow the integration model set by Brussels and adjust its foreign policy objectives, and the administrative approach characterized by encouraging political, economic and social reforms in the country. Direct political pressure manifests itself by the EU insisting first that Serbia successfully concludes its negotiations with Kosovo, and second, that it distances itself from Moscow. On both issues the citizens of Serbia and their government are not of one mind, and the government is facing an uphill battle indeed. Enacting significant economic and financial reforms is an equally daunting task. 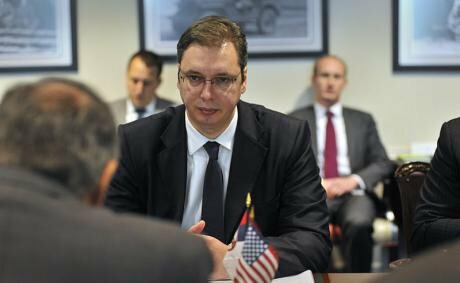 The government in Belgrade is struggling with a foreign policy reorientation. When it comes to continuing negotiations and resolving long standing territorial disputes with Kosovo, the situation is at a standstill, and politicians in Belgrade and Brussels are avoiding discussing the subject. The silence of the officials with regards to Kosovo is in part the product of uncertainty amongst EU members of just how to approach the issue. Five EU member states are yet to recognize Kosovo. This despite the fact that Serbia’s recognizing the political reality of an independent Kosovo is one of central conditions of its future EU membership. With that in mind, Serbia’s recognition of Kosovo seems just a matter of time. The success of talks between Belgrade and Pristina will be assessed as part of the otherwise less significant Chapter 35, dealing with various bilateral issues. Because of Kosovo, this Chapter will be open first and most likely remain open for the duration of the negotiation. Skeptical voices within Serbia suggest that the pressure from Brussels paired with the desire of both Kosovo and Serbia to join the EU separately is the only reason why the conversation between Belgrade and Pristina is still active. As a consequence, they posit, almost all of the issues discussed have been imposed by the EU administration. It is apparent that Germany is very keen on seeing the relations between Serbia and Kosovo enter a more stable phase. Sonja Biserko of the Helsinki Committee for Human Rights in Serbia is of the opinion that the most recent German-British initiative on Bosnia and Herzegovina will have an impact on Serbia’s position on Kosovo. Furthermore, she expects the EU to demand that Serbia distances itself from the Republic of Srpska para-state as well. Aleksandar Vučić’s government is also performing the dangerous balancing act of swinging between the EU and the US on one side, and Russia and China on the other. The earlier political dictum “Both Kosovo and the EU” has been now modified into “Both Russia and the EU”. Serbia had refused to join the economic sanctions imposed by the US and the EU against Russia. In an interview for CNN in August 2014, the Prime Minister Aleksandar Vučić, reiterated that his country "supports and respects the territorial integrity and sovereignty of Ukraine and Crimea as a part of Ukraine." He added that at the same time, however, Serbia "did not" impose sanctions against Russia. The Serbian political elite, however, has quickly learned that the time of non-alignment and neutrality belongs to yester-years. Serbia has been reminded time and again by its Western partners of the need to make a choice, and of the fact that the New Cold War reality demands unwavering loyalty. It is also worth noting that Serbia became a member of the Partnership for Peace at the 2006 NATO Summit in Riga. On the other hand, the government in Moscow is sending a clear message that it does not look benevolently upon Serbia’s EU aspirations. In an interview for the Serbian State Television, the Russian General Leonid Ivashov stated that Serbia in the EU and NATO would be “a catastrophe”. It is reasonable to assume that the pressure from Moscow would only increase over time. Within the ruling party there seem to be dissonant voices on the issue of choosing between EU and Russia. The President of Serbia, Tomislav Nikolić, disagrees with the prime minister about their country’s EU and NATO integration, and favours stronger ties with Russia. Nikolić’s attempt to maintain close relations with Moscow is informed by his understanding of history and the political usability of the memory of the recent confrontation with NATO, as well as the ideology of nationalism to which he wholeheartedly subscribes. He is supported in that by the entire right-wing political block that currently commands the loyalty of a sizable portion of the electorate. President Nikolić is also aided in its pro-Russian stance by the high ranking clergy of the Serbian Orthodox Church. Some analysts, however, interpret his dissent as a tactical maneuver that portrays Prime Minister Vučić as a reform-oriented centrist determined to see Serbia become a part of the EU, and as a politician who is facing stiff opposition. The prime minister, long known as a hot-bloodied nationalist, indeed appears eager to project the image of himself as Serbia’s last chance for salvation and a victim of historical circumstances. Vučić believing in his messianic role notwithstanding, the reality is that criticisms of his policies are few and far between. His standing as the most popular politician in Serbia was built on the perception of his determined fight against deeply rooted corruption even though the results of such struggle are yet to manifest themselves in earnest. Many in Serbia say that Aleksandar Vučić had promised a lot but delivered precious little. On the economic front, Vučić’s government is engaged in what it defines as aggressive and necessary economic restructuring. It is selling large state enterprises, which previous governments were reluctant to privatize, and justifies it by stressing the need to attract foreign investments. Aleksandar Vučić’s election campaign rested almost entirely on the political mantra of bringing in foreign partners who would revive Serbia’s fledgling economy. He spoke of many billions of euros that would be invested by wealthy individuals and companies from the United Arab Emirates. Those funds were to be used for many projects in Serbia such as purchasing of state-owned land in Vojvodina, opening a microchip factory by the Mubadala Development Company from Abu Dhabi, a taking over of the bankrupt state-owned JAT air-carrier (later renamed Air Serbia) by the UAE’s Etihad Airways, as well as building of a mega project Belgrade on Water (Belgrade Waterfont) courtesy of the UAE investor Mohamed Allabar. Moreover, Vučić also promised the signing of a new strategic contract with Mercedes in order to revive the production line in the old FAP truck factory in Priboj. The takeover of JAT was plagued by controversies, and the former Minister of Economy, Saša Radulović, resigned in January 2014 because he viewed the contract signed with the Etihad Airways as very unfavourable to Serbia. The Serbian government also issued a tender for the Smederevo Steel Plant following it being abandoned by its previous owner, US Steel. This tender had failed because only one offer came in. It was an offer by an off-shore company from the Netherlands whose address is the same as that of the MNSS – the owner of the Niksic Steel Plant (Montenegro). It is worth mentioning that the MNSS has been linked with businessmen close to the Montenegrin Prime Minister Milo Đukanović. By far the most significant decision Vučić’s government has made to date was to issue a tender for the privatization of a very profitable Telecom company. That was something no previous government did. It is clear that the sale of strategically important economic enterprises to foreign investors is seen by the Serbian prime minister and his government as the central feature of their model of economic reforms. The expectations are that funds raised in such a manner would lessen the massive budget deficit that is now approaching 71% of the GDP. During the last two years of Vučić’s governing, Serbia’s budget deficit has increased by 80%. In monetary terms this increase approaches the figure of 800 million euros. Back in 2003 the deficit was 750 million euros, while in 2012 it reached the amount of 1.05 billion euros. In 2014, however, Serbia had a budget deficit of 1.8 billion euros. While these figures might sound less than alarming when compared, for example, to the budgetary deficit of Greece, the fact remains that the Serbian economy would not be able to easily and quickly fill this financial void. Austerity measures, therefore, are a real possibility, and that could seriously destabilize the political situation in Serbia and impact negatively its government’s efforts to meet the membership criteria for the EU. The possibility of such an outcome is a good reason for the EU to rethink its negotiation strategy and maybe design ways that would offer greater incentives for continuing reforms in view of Serbia’s membership to the EU. Such incentives, if they materialize at all, should take into consideration increasing Russian political and financial influence in the region. Failing that, we might witness another potential EU member state responding favourably to (or being intimidated by?) Eastern Promises and swinging away from Brussels and towards the so-called Eurasian union. I am grateful to Dr. Guzina for allowing me to consult his work in progress on the strategies of EU expansion in the Western Balkans.